“I guess the guys who played must have ate at a different restaurant because we played with a lot of energy,” added Pacers reserve Kyle O’Quinn, who had 12 points and 10 rebounds against his former team. Indiana led by 12 at halftime, but Orlando rallied quickly in the second half, cutting it to 63-59 on Gordon’s dunk with 7:42 left in the third period. Indiana responded with a 15-2 run that Evans started with a driving layup and finished with a fallaway 3-pointer. Indiana’s defense took away the perimeter game from a Magic team that had made 20 3-pointers the previous game against Denver. 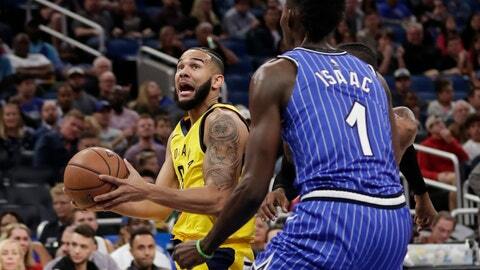 The Magic were eight for 33 (24.2 percent) on 3-pointers against the Pacers. The Magic survived a scare in the first quarter when Vucevic stayed on the floor clutching his ankle after coming down on Turner’s foot. The Magic center limped over to the bench and took a seat, but was back in for the final 7:21 of the second period. PACERS: SG Victor Oladipo’s sore knee kept him out for the ninth straight game. … Indiana is 8-6 on the road this season, one of only two Eastern Conference teams with winning road records.